High Performance photoluminescent green marking paint kit consists of a white base coat and a tough epoxy glowing photoluminescent coat with integrated sealer. Pale greenish-white under normal light, but produces a bright green glow when the lights are out. Our AfterGlo® Brand Photoluminescent Paint is ideal for filling lines and characters engraved into flat or curved surfaces where the lines and characters need to be visible in low light situations. Suitable for filling specialty engravings and markings and a good replacement for AA-3059 type paints. 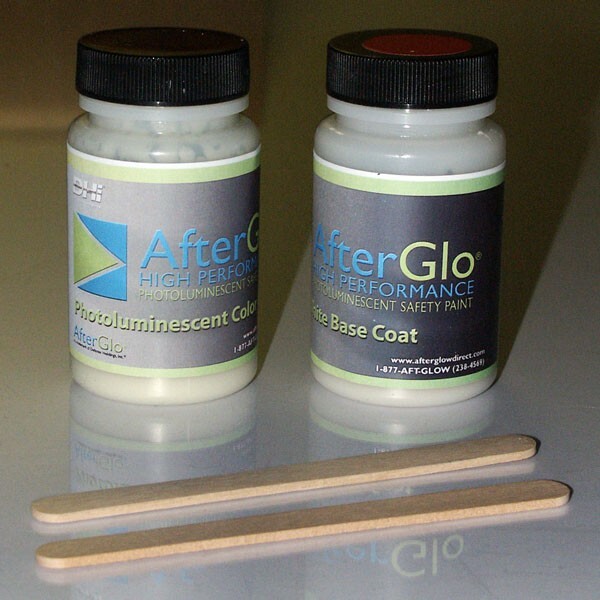 Our AfterGlo® Brand latex PL paint kits are available in 2 fl-oz., 4 fl-oz., 8 fl-oz., 16 fl-oz., and 32 fl-oz. sizes.